Can Truck Brakes Lead to Accidents? Do Large Trucks Frequently Catch Fire? Do Large Trucks Roll Over Easily? What are “No Zone” Crashes and How Can They be Avoided? What is a Jack Knife? According to the National Highway Traffic Safety Administration (NHTSA), in 2000, 11% (4,719) of all motor vehicle traffic fatalities reported involved heavy trucks with gross weight greater than 26,000 pounds. One percent of traffic fatalities involved medium trucks with gross weight between 10,000 and 26,000 pounds. 79% of the large trucks involved in fatal traffic accidents in 2000 collided with another motor vehicle. Large trucks were involved in 261 multiple vehicle crashes which resulted in a fatality and 480 single car crashes which involved a fatality. 410 Pedestrians and pedal cyclists were killed in accidents involving large trucks. The majority of the fatalities suffered in accidents with large trucks involved occupants of the other vehicles with which those trucks collided. 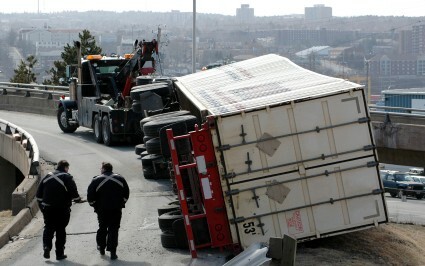 NHTSA reported that in the year 2000, one out of nine traffic fatalities resulted from a collision with a large truck. 4% of all vehicles involved in injury and property damage only crashes involved large trucks in the year 2000. Alcohol does not appear to play a prominent role with respect to large truck/auto accidents. NHTSA data found that only 1% of the drivers of large trucks involved in fatal crashes in 2000 were intoxicated as compared with 19% for passenger cars, 20% for light trucks and 27% for motorcycles. Of the fatalities that resulted from crashes with large trucks with a gross weight rating over 10,000 pounds, 78% were the occupants of the other vehicle, 8% were non occupants and 14% were the occupants of the large truck involved in the accident.